Popular “trigger” platform, If This Then That (IFTTT), has updated its iOS app with a Location Channel, allowing users to trigger events when they are in the vicinity of a certain place. For example, pairing the iOS Location Channel with my WeMo Light Switch will trigger Belkin’s WiFi-enabled light to turn on when I’m near home, and switch off when I’m no longer in the area, in case, as I often do, I forgot to do it manually. The app provides pre-made iOS Location recipes for Facebook, Twitter, Foursquare and Instagram, but the options are pretty limitless without enough imagination. Location is easily one of the most useful ways to trigger events on a mobile device, as popular Android apps Tasker and Llama have proven. Speaking of Google’s platform, IFTTT has begun talking about an Android app, though no ETAs were given. There’s potential for the company to use Android’s inherent openness to its advantage, and it will be exciting to see how they differentiate it from the iOS and web versions. Other improvements in the new iOS app centre around the sharing of recipes: starring a recipe saves it to your favourites, and those who follow you can see your activity to easily discover new ways to use it. Finally, the app now has extensive recipe search, both for those you currently subscribe to and others that may interest you. 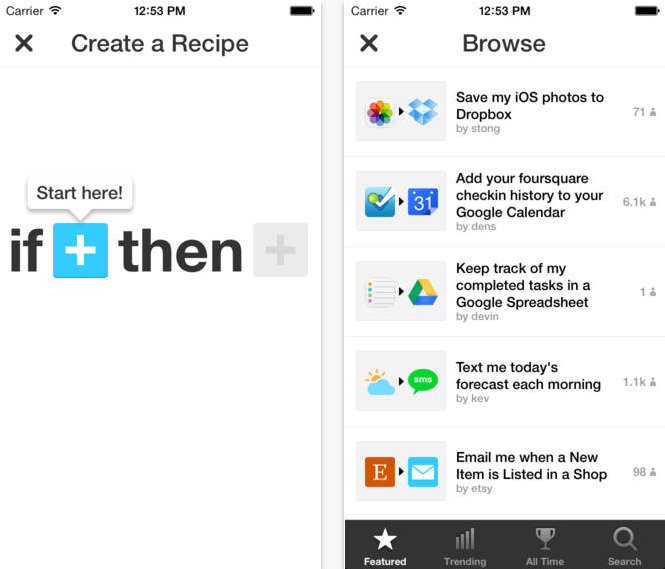 IFTTT has proven to be one of the most consistently-useful apps on my iPhone, and it’s well worth examining on the web, too.